Using a transistor as an amplifier to control a motor. We generally use a transistor in two different ways. We will use a transistor as a switch, or we will use a transistor as an amplifier. There are also two main types of transistors: NPN, and PNP. The NPN transistor interrupts the negative side of a load. The PNP transistor interrupts the positive side of a load. 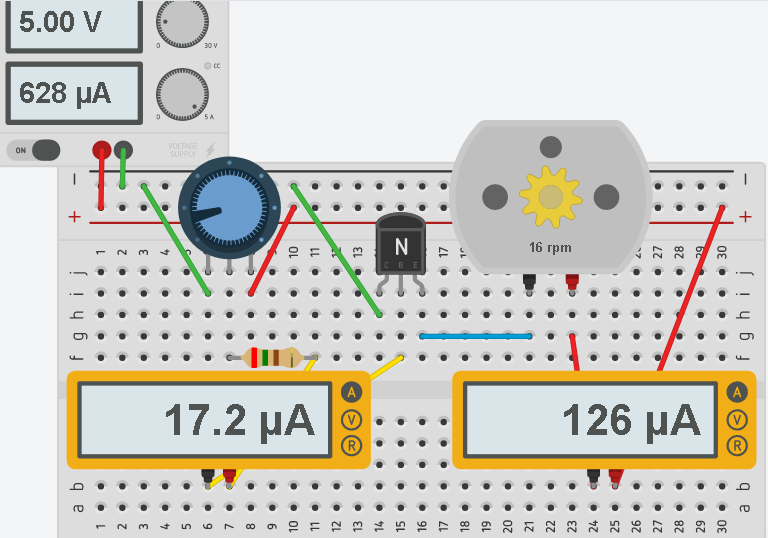 In this example, we will use an NPN transistor to control a motor. In this example, I’m using a 10K pot in series with a 250 Ohm resistor. We are using tinkercad. The reason I’m using the 250 Ohm resistor is to limit the amount of current flowing to the base of the transistor. If we have too much current flowing to the base, the transistor will be damaged. 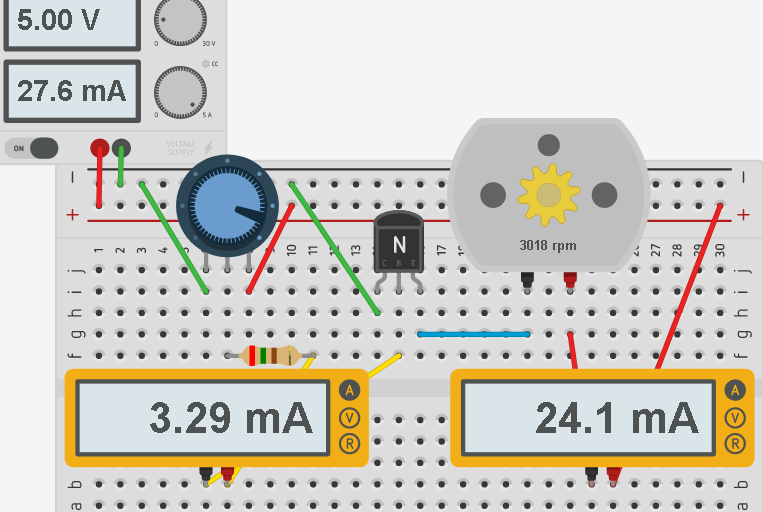 This circuit will control the speed of the motor. The transistor is a current controlled device. This means the more current that we have flowing to the base of the transistor, the more current will flow through the motor. Since we are using an NPN transistor, the negative lead of the motor is interrupted by the transistor. The main current will flow from the positive rail, through the motor, into the collector of the transistor (right pin) and out of the emitter (left pin) to ground. Now, well apply some current to the base of the transistor. When we turn the potentiometer up, the transistor will begin to conduct at a certain point. The transistor is now operating in the depletion region. As we continue to increase current to the base, you will notice the speed of the motor increases. Also take note of the current to the base of the transistor. We are using a small amount of current to control a larger load. In the above example, only 17.2 MicroAmps are flowing through the potentiometer. However, 126 MicroAmps are flowing through the motor. in this example (above) 3.29 mA control the motor which is consuming 24.1mA. Eventually, as we apply more current to the base, the transistor will be fully “ON”. Additional current to the base has little effect. This is the saturation region. 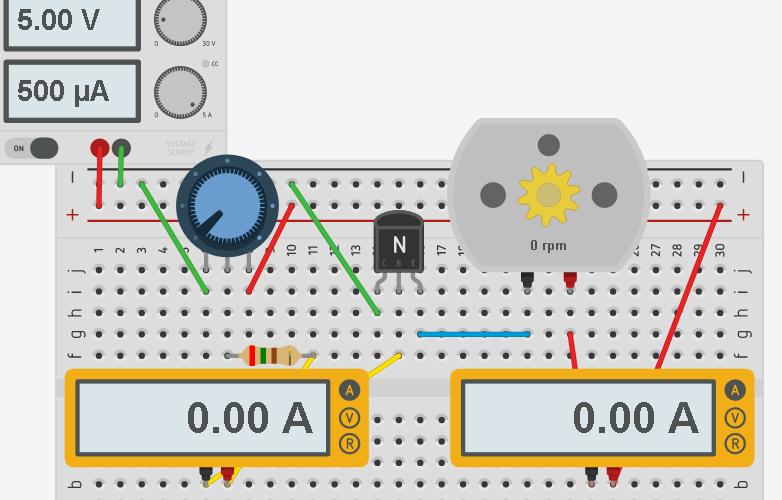 For other tutorials on basic electronic circuits, visit the Beginner’s page!